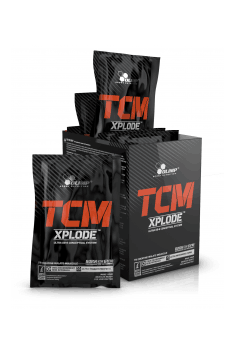 Olimp TCM Xplode is an improved form of creatine malate, a highly absorbable form of the most popular supplement increasing endurance capacity. The supplement was invented to provide maximum absoprtion and effectiveness of creatine. Creatine is without a doubt the best researched and the most popular dietary supplement. It shows undisputed effectiveness in increasing physical capacity, especially in case of athletes doing short trainings. At the same time, numerous studies prove safety of creatine use. Its high effectiveness results mainly from its main mechanism of action. It provides a substrate for energy production, which directly increases process efficiency and allows for producing larger amounts of energy in form of its universal carrier, ATP. This is associated with higher exercise capacity and more intensive training stimuli, which results in faster progress. Creatine has also other mechanisms of action, including ability for modifying activity of myostatins, which promotes muscle anabolism. CREA Loading DB-6 System – is a combination of components contained in the preparation, except for creatine. They include sodium bicarbonate and sodium citrate, which are salts of alkaline pH. They play different roles in the supplement. First of all, they increase creatine stability within the low-pH environment, so that the maximal amount of creatine reaches the intestines. Secondly, the salts ensure the optimal environment in a metabolically charged cell, which allows for more smooth use of phosphocreatine and its introduction into energy paths. Thirdly, they play a role of pH buffers within muscle tissue, as they neutralise the increasing acidification during physical effort, which reduces exercise capacity. CREA Loading DB-6 System contains also vitamin B6. Its presence in the mixture is reasoned by studies, which indicate its ability to increase the ratio of creatine absorption. In this way, it is more quickly available for working skeletal muscles. Shorter time of creatine absorption allows also for reducing the time spent by creatine in unfavourable conditions within the digestive system. The last component of CREA Loading DB-6 System is vitamin D. It activates beta cells of the pancreas, which secret insulin. The hormone is a natural transporter of creatine, which is why its secretion increases creatine bioavailability. The second technology used in the supplement is TCM Ultra Pure. This is the purest form of creatine malate in its maximally micronised form. It is developed in a labolatory, in pharmaceutical standard, which guarantees the carefully measured amount of active substances and safety of use, also regarding potential microbiological pollution. To sum it all up, Olimp TCM Xplode is creatine malate enriched with a complex of substances maximising its absorption and promoting the action. It allows for much more effective supplementation with creatine and maximal benefits guaranted by this powerful supplement. 1 portion just before workout and 1 portion immediately after workout. 1 portion (3,9g of powder - 3/4 flat teaspoon) mix in 120ml of water. 2 portions during a day. Some may be suspicious about small doses recommended as one-serving portion. However, such dosing is sufficient. The popular, higher dosing is reasoned by lower stability of other creatine forms, which is compensated with higher one-serving dose. Because of high absorption of the supplement, there is no need of increasing the single dose. Aroma, silicon dioxide - anti-caking agent; E150d (for the taste of xplosion cola); cyclaminates (for the taste of xplosion cola), acesulfame K, sucralose - sweeteners; pigments: cochineal (for the taste of fruit punch), carotenes, riboflavin (for orange flavor), riboflavin (for lemon flavor).